Ogre is now officially in manufacturing (cue delirious cheering here at the office). Following manufacturing comes assembly, then shipping, and then . . .
. . . the Launch Party will be on Saturday, October 19 in Austin. Watch this space for the registration announcement, coming soon. We'll start shipping Kickstarter games (and extras!) from our warehouse on Monday, October 21. 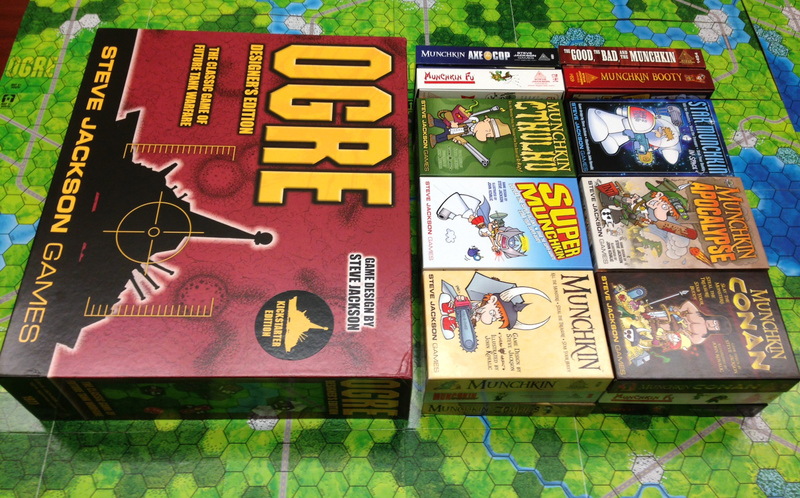 Expect to see Ogre in stores in late November to early December. These dates are final, barring something unexpected. We think there won't be any delays from here. What could go wrong? Something happening to the factory; assembly issues; enemy cyberships lying in wait outside Hong Kong harbor; BGG-Zilla coming to life and stomping all over. You get the picture. We're sorry about the delay in releasing Ogre. We underestimated the size of the game, and the effect the Kickstarter support had on what comes in the box. The pictures help indicate just how much game we're making. We're not kidding when we say that something this epic has never been attempted before in the industry!